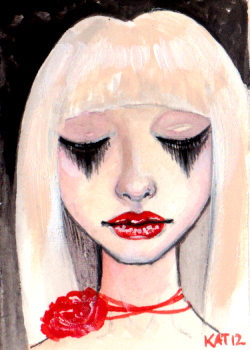 A little ACEO sized painting. Inspired my Moon Goddess doll by Marina Bychkova of Enchanted Dolls. Lindsay Nucera says: Hi Kim. ~ Thank you for choosing one of my prompts. ~ I am honored. ~ Love the lashes and the "crimson" touches. ~ .xox. ~ Reply?